“Once considered a futuristic technology on the distant horizon, 3D printing of medical devices, medications and human tissue is quickly becoming a promising reality,” stated FDA Commissioner Scott Gottlieb, M.D. in his announcement. “Patients have already benefitted from 3D printed medical products through access to personalized devices and innovative drugs that have led to significant health improvements,” he added. Today, there are more than 100 3D printed devices on the market reviewed by the FDA. These include knee replacements, cranial and facial implants. The Agency also approved the first drug produced on a 3D printer, which is used to treat seizures and has a more porous matrix than the drug manufactured in the traditional way, enabling the drug to dissolve more rapidly in the mouth to work faster. “This is likely just the tip of the iceberg given the exponential growth of innovative research in this field. We envision that burn patients in the near future will be treated with their own new skin cells that are 3D printed directly onto their burn wounds. Further down the road, there is the potential for this same technology to eventually be used to develop replacement organs,” said Gottlieb. On Dec. 5, FDA issued new guidance to clarify FDA recommendations to manufacturers on submissions for 3D-printed medical devices. The Guidance discusses the Agency’s current thinking on various approaches to 3D printing, including device design, testing of products for function and durability, and quality system requirements. 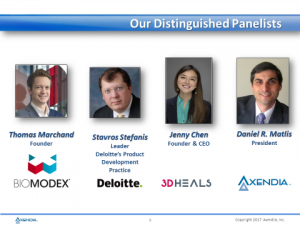 The intent is to help manufacturers bring their innovations to market more efficiently by providing a transparent process for future submissions and ensure that FDA’s regulatory approach is properly tailored to the unique opportunities and challenges posed 3D printing. To learn how 3D printing is ushering in the Precision Medicine Revolution listen to this on demand webinar.